Takashi Miike has provided some of my favourite films from the other side of the world in the past 15 years or so. From the horror classic Audition to the cult classic Ichi The Killer and more recently 13 Assassins. Manga / Anime is another passion of mines (though a little non-existent past few years) and for Miike’s latest film to come to the UK he takes a popular Manga title based on Hiroshi Takashi‘s story which ironically the film he made just before 13 Assassins, CROWS ZERO II. Crows Zero 2 years before was an instant hit however in 2009 Crows Zero II was even more of a success in its native Japan but as cinephiles know box offices sales don’t always match the quality of the film. So is it Sequel blues a good entertaining film that surpasses the first film? Crows Zero II follows 6 months after the events of the first film with Genji Takiya (Shun Oguri) has unified the School Of Crows, the various factions of Szuran Boys High School. The takeover was a bloody one but Genji’s victory has left him unsatisfied and the uneasy peace amongst the students, in reality, nothing more than a powder keg waiting to explode. Making the situation even more volatile, a truce that has been maintained between Suzaran High and it’s bitter rivals Hosen Academy is about to come to a violent end. Takashi Miike was the attraction of this film for me but after accepting to review Crows Zero II, it dawned on me, I’ve never seen Crows Zero so will I understand the story of film 2? The cross-references from the first film did leave a little complexed however after those this film is actually quite an easy film to follow even if you haven’t seen Crows Zero. One of those subplots that crossover is with his club singing girlfriend and his Yakuza father obviously there was plenty referencing to the first film but as I said these parts were minimal though I’m curious on Genji’s father’s story as possibly a lot happened in the first film. 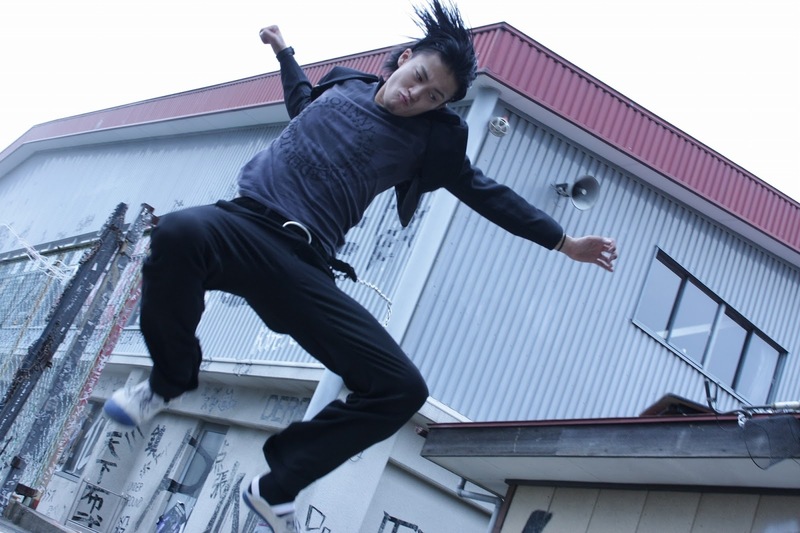 Crows Zero II is a testosterone action fuelled slamfest from start to finish, there’s never a moment we don’t have someone getting their head kicked in. What I’ve heard the fighting is a lot more realistic compared to the first film, it’s not martial arts but good old street brawling with knuckles and knees your only weapons. The last fight scene especially it’s length is reminiscent of the end battle scene of 13 Assassins about 30minutes long building up to the big conclusion between the gang leaders. The way it cuts between the films main characters building up the tension the excitement highlighting the chaos of these brawls helping the motion flow as the makes their way up the school stairs. Each level they get the opponents to get tougher which is a bit like the superb The Raid. I really wanted to be really positive about this film, give it a chance so I spoke to a few fellow bloggers to get the lowdown and I get the impression Crows Zero was rough around the edges, raw inspired more on its Manga source. As I said I’m a fan of Manga/Anime can spot something inspired by the culture and Crows Zero II does feel less inspired by Manga a little more serious in nature but all round more polished production. Crows Zero II is a film made for one demographic alone, the video gaming adolescent teen who love reading those manga books which are like the size of bibles, listening J-Rock. The film gives them another platform to let rip of those raging hormones they have building up, as for the music influence many of the cast just happens to be from many of the bands that provide the soundtrack. Every so often we would cut from a scene into a full-blown video which is great though a little annoying in the way when you’re watching your favourite show on TV and as the action gets good it cuts to an advert. In retrospect, if you are a fan of the whole J-Culture Crows Zero II will be right up your street. 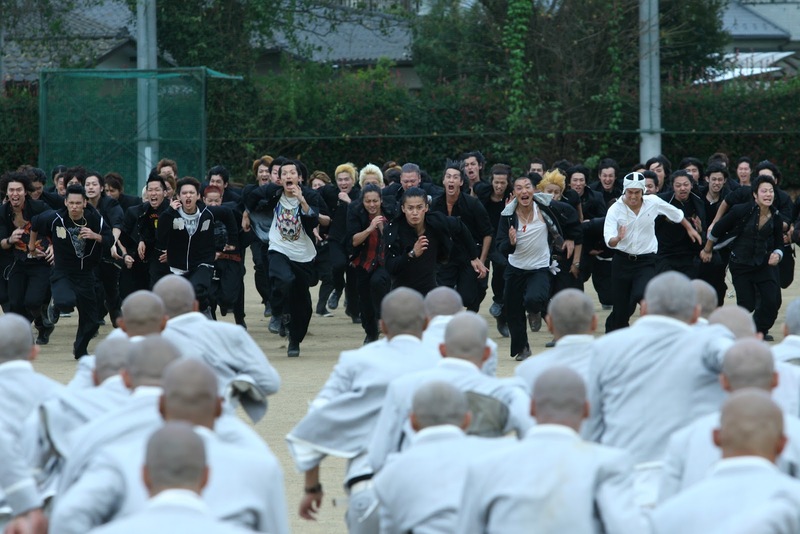 Overall Crows Zero II is an entertaining stylish brawl. Don’t expect political correctness just plenty of mumbo-jumbo cheesy dialogue and characters who have egos that are bigger than the Empire State Building In New York. The film does go a little stale in the middle as well as some jokes falling flat there is enough going on to keep you entertained for the films 2-hour running time and I would go as far as saying there’s enough untold story to merit a third film. Previous Post Who Is Jacques Mesrine?